United States air marshals are the first police force of the federal government created solely to protect against terrorism. Though they existed in limited numbers prior to the September 11, 2001, terrorist attacks, the signing of the Aviation and Transportation Security Act (ATSA) on November 19 of the same year completely changed the nature of the air marshal program. The ATSA created the air marshals' new employer, the Transportation Security Administration (TSA), and within a little more than a year, several thousand air marshals were on the job. Air marshals perform their job discreetly, and many aspects of the program are deliberately kept secret so as to increase its effectiveness. At the end of 2001, the federal air marshal program had 33 armed officers, and a budget of about $4 million. A year later, the number of employees had swelled into the thousands—U.S. officials are reticent, for security reasons, to indicate the number of air marshals that have been deployed—with a budget of more than $1 billion. The rapid pace of growth was symptomatic of a larger change in the face of air travel after the September 11th attacks. In the aftermath, the federal government placed security screeners under government employment, and planned to put in place a new computerized passenger-profiling system. These were visible signs that the ordinary traveler could hardly fail to notice. Most of all, travelers were confronted with long lines to enter terminals, and with new security rules. Only persons with a ticket were permitted past security checkpoints and into departure gates, and even the most seemingly innocuous items, such as tweezers, were subject to confiscation by security screeners. By January, 2003, all passengers were additionally required to bring luggage intended to be checked into the hold of the aircraft to a screening point for x-ray or other scanning. The invisible air marshals. In contrast to these visible signs of change, there was one change passengers were not likely to notice: the addition of air marshals. In fact, if a marshal's presence on a routine flight was noticed, that meant he (more than 95% of air marshals are male) was not doing his job correctly. A key element of the marshal program is its invisibility, and this is so for a number of reasons, not least of which is the fact that not every flight has a marshal aboard. At any given moment at the height of business hours, there are approximately 6,000 commercial flights in the air somewhere in the United States. Every day, 25,000 aircraft take off and land, and though the ranks of the marshal program have swelled since September 11, it is not possible to have a marshal on every flight. Officials estimate that even for the highest-priority flights (the determination of which is made by analyzing a number of factors, such as major events that may attract tourist attention), only about 15% had an air marshal on board in the first year after September 11. The air marshal's work. Federal air marshals, known as FAMs, go through a specific procedure when assigned to a flight. They dress in civilian clothes, and before boarding, present their credentials to a ticket agent, who gives them a ticket. Since September, 2001, ticket agents have been trained in this procedure, and are aware of the security precautions involved, which include not drawing any attention to the fact that an FAM is present. 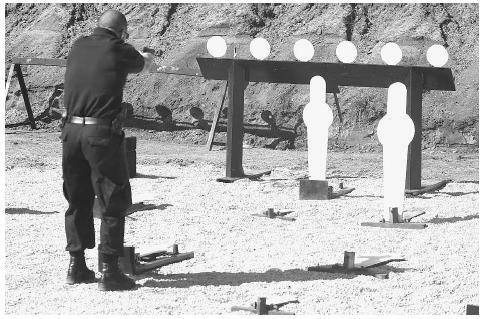 A federal air marshal trainee shoots live rounds during a training session in Egg Harbor Township, New Jersey. Thousands of armed, undercover air marshals have joined the service since the September 11, 2001, terrorist attacks and are flying carefully chosen missions, sometimes on an hour's notice because of new terrorist threats. check, because he is armed. Once aboard the plane, the crew has knowledge that a marshal is on board, and therefore, he is permitted access to discreetly check all areas of the plane. Federal air marshals are trained to have a variety of ordinary cover stories available to discourage suspicion about repeated movements in different areas of the aircraft, should they become necessary. The Federal air marshal program motto is Invisus, Inauditus, Impavidus —unseen, unheard, unafraid. Hazards of the job. In the first year after September 2001, FAMs made a dozen arrests, none of them related to terrorism. They filed about a thousand reports of suspicious activities on planes, but these numbers have shown signs of decreasing as time as passed. Apparently, in the early months, FAMs tended to be overly cautious or overly reactive to potentially dangerous situations, but experience has made them more judicious. Early assessments of the FAM program suggest that perhaps the greatest routine occupational hazard is a decrease in concentration due to the monotony of being a repeated airline passenger. Flying tends to be taxing enough for civilians who do it regularly, but the FAM does not have the option of going to sleep. Nor is he free to lose himself completely in a book or magazine article, or an inflight movie, though he may take part in such activities as a means of blending in. On the one hand, the FAM must try to appear completely ordinary, and on the other, he must be on the alert at all times. Concerned about the effects of flight fatigue on air marshals, the TSA in January, 2003, announced plans to temporarily reassign some FAMs. In order to gain some relief from the boredom and exhaustion of flight, some of these agents would serve in airport terminals, providing surveillance. This announcement elicited considerable criticism, particularly from airport security officials, who complained that the FAMs were most needed in the skies, and that airports were already overstaffed with security personnel. Issues of training and expertise have also raised concerns about the FAM program. Prior to September 2001, FAMs received 12 weeks' worth of training, but afterward, officials of the Federal Aviation Administration (FAA) and later TSA found themselves faced with a demand to hire and train some 800 FAMs a month. As a result, new recruits found themselves on the job with less than seven weeks' training. Those with previous federal law-enforcement experience might be deployed after as little as a single week of compacted instruction. In May 2002, as the Senate was considering legislation to allow pilots to carry handguns, TSA director John Magaw testified that the expertise of FAMs was such that pilots did not need to carry guns. However, TSA officials later acknowledged that new recruits had not been required to undergo the rigorous shooting tests required of air marshals prior to September, 2001. Given the fact that the program had experienced a sudden upsurge in its personnel rolls—equivalent to that of an army mobilizing after a declaration of war—inefficiencies were virtually inevitable. The challenge with which directors of the FAM program were confronted after September, 2001, would have been daunting for any agency, public or private, and thus, the program requires more time before its full effectiveness can be accurately assessed. Donnelly, Sally B. "Grounding the Air Marshals." Time. 161, no. 4 (January 27, 2003): 17. Lombardi, Kate Stone. "Air Travel Under a More Watchful Eye." New York Times. (January 26, 2003): WC1. Schneider, Greg, and Sara Kehaulani Goo. "For Air Marshals, a Steep Takeoff." Washington Post. (January 2,2003): A1. Wald, Matthew L. "New Rule to Limit Boarding Passes from Gate." New York Times. (December 10, 2002): A24. "Armed Air Marshals for UK Flights." British Broadcasting Corporation (BBC) News. < http://news.bbc.co.uk/1/h1/uk_politics/2590309.stm > (March 5, 2003).